Here’s Mike’s selection of secondhand Sporters that offer great value for money. Located 600 miles east of Moscow, Izhevsk’s main factory produces pistols and rifles, several variations on the AK assault rifle theme, air guns – and the Baikal shotgun. The Baikal dates to the Cold War, and was once humorously said to be made from melted-down World War II tanks, with stocks carved from Trans-Siberian railway sleepers. The machining might have been rough in places, the blacking a bit grey, and the woodwork of unknown origin, but the guns were incredibly tough and reliable. Nowadays Baikals are imported by York Guns, and a typical offering is the Baikal 27, which sells at around £800 new. You can specify 28 or 30in barrels,and the tubes are internally chromed and threaded for multichoke tubes. The gun illustrated represents a brief association Remington had with Baikal when it wanted a cheap break-action gun, which it named the Spartan. You can buy a secondhand Baikal over-and-under for £30, but a recent gun doesn’t break the bank, and there are good 27s for sale at around the £300 mark. Just over 30 years ago, I celebrated a pay rise by treating myself to a new Beretta 682 Sporter, a gun which had just been introduced to the UK market. The acquisition was the start of a love-hate relationship. together with the quality of the steel and the woodwork just had to be admired. others do best with a deeper-actioned gun, typified by Browning and Mirokus. needed very few mechanical changes. It’s still an evergreen, only overtaken very recently by the new 692. Over the years, the 682 came in various versions, but if I was buying second-hand I wouldn’t worry too much about the version as long as the gun fitted me and the price was right. Go for condition rather than age – Berettas of 20 and more years old have an excellent reputation for reliability. In the mid-1960s, Browning teamed up with Miroku of Japan. John Moses Browning’s immortal B25 had become too expensive to manufacture at the headquarter’s factory in Herstal, Belgium, and the company wanted a series of affordable guns to make it a major player in world markets. The move led to the successful Mirokubuilt Citori, B325, B425, B525 and B725, which were, and are, among the leaders in the US and European markets. So what happened to John Moses’s masterpiece? Moses filed the patents for his B25 in the 1920s, and boasted of the huge number of steel mixes, machining, hand-fitting operations and tests which went into making it. The B25 was therefore expensive and still is, but it is also one of the most sought-after classic shotguns in the world. production model. They have been in continuous production since then, with the exception of the war years when Brownings were forced to make military arms for the occupying Germans. The gun is now handmade mainly to special order in the Browning Custom Shop in Herstal. Top versions must be among the most expensive boxlocks ever made. There are many versions, most known by strange combinations of letters and numbers such as B2G and D5G, to name two of many. These signify different standards of finish, engravings and woodwork which can be viewed on the Custom Shop website. 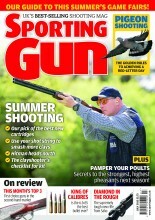 The gun illustrated is a B2G, and a new gun costs £12,000 – though the sky’s the limit if you want a real topranking B25s. You should get a good second-hand version for £6,500.